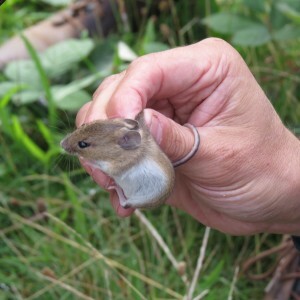 On Saturday 30 August, Darren Tansley, Water for Wildlife Officer for the Essex Wildlife Trust, demonstrated survey methodology for small mammals in the Old Sewage Works. Darren gave 10 Wren Group members some fascinating insights into the behaviour of voles, mice and shrews, and explained best practice the setting of traps so that animals are not harmed. Darren and Tim Harris has set 30 traps the previous evening and 11 of these had been used during the night. We found four Wood Mice (2 males, 1 female and 1 that escaped before being sexed!) and a single Field Vole. Six other traps had been entered, though there was no animal within; this is suggestive of shrew activity, with both Common and Pygmy likely to be on-site. Each trap has an escape hole for shrews at the back, because these tiny insectivores need to feed regularly or they will die. 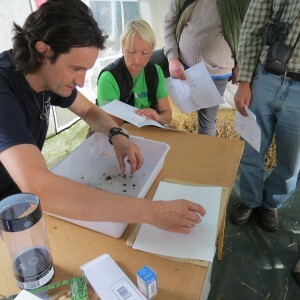 Darren later demonstrated how checking the pellets of owls and other raptors can indicate what species of prey are on-site. Examination of dental patterns and skull shape indicates whether the bones in a pellet are those of a shrew, mouse or vole. Thanks are due to Darren for sharing his knowledge with us, and thanks also to the Riding Stables for letting us use of their gazebo for the pellet analysis.